So I was in Publix the other day (our area grocery store) and in the bakery section they had this granola bark. It looked so good, but it was way to pricey for my liking. This was something I knew I could make but needed a basic recipe to go by. After doing some research on the interwebs I found a recipe I could use as a starter (and believe me, there wasn't much out there). I added a few things of my own, but basically left the recipe as is. Next time I think I may add some maple syrup, or maybe some brown sugar in place of some of the honey. This took a little over an hour to bake, and prep was like 10 minutes (if that). I can see myself eating this as a snack, or even for breakfast. It keeps for 2 weeks stored in an airtight container or ziplock. 1. Place an oven rack in the lower-middle position and heat the oven to 250 degrees. Line a cookie sheet with parchment paper. 2. 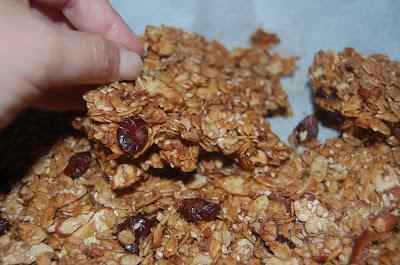 Place the oats, almonds, coconut, sunflower or pumpkin seeds, sesame seeds,dried cranberries,chocolate chips, and spices in a large mixing bowl and toss to combine. 3. Heat the butter and honey together in a small, heavy-bottomed saucepan over low heat until the butter melts. Stir in sea salt and vanilla. Remove from the heat. 4. Pour the hot liquid ingredients over the dry ingredients and stir with a wooden spoon or rubber spatula until the dry ingredients are evenly moist. 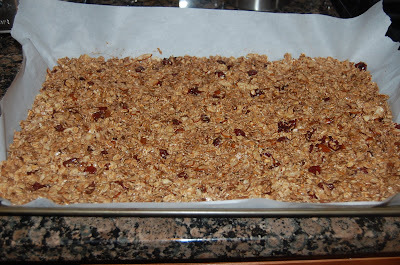 Cool in the pan, then lift an edge of parchment and break the granola into pieces. What a great healthy snack!! This stuff is addicting. Looks delicious! My husband would love this - thanks for sharing. i love this recipe!! looks so yummy. thanks for posting. This looks wonderful and easy to make too! I just bought some of this on sale at Publix last night and am already addicted. :o) I can't wait to try making my own! 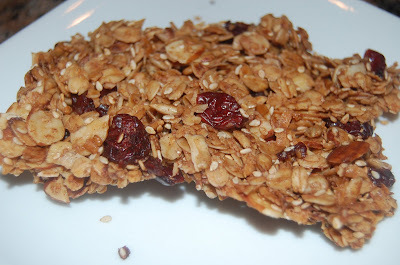 This is a true healthy and easy snack, and can be prepared at home, I should do a batch and snack on it, I bet it will taste good with the maple syrup. I tried the recipe you posted but it didn't look anything like Publix. I asked Publix yesterday how they baked theirs. They said they sprayed the parchment paper with veg. oil and used powdered sugar to bind ingred. together as it baked. Well that didn't work either, so I put it into a container and we are eating it as is....just as good if not better than if you were to use wet ingred. and bake. I buy it constantly at publix and it is pricey, but delicious. so thinking i would try it myself, i took a chance today and asked the lady in the bakery just what was the ingredient holding all of the items together. She told me it was "organic sugar". I don't know if this will make a difference in your recipe, but that's one ingredient. This stuff is great. Cheryl - You left "oats" off the Publix wrapper ingredient list. The recipe on this site appears to have far too many oats in it. 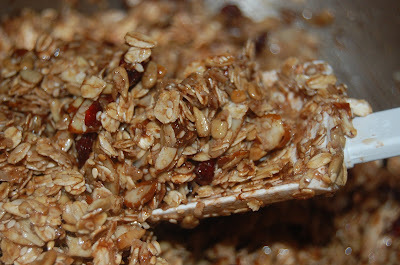 The bark from Publix is much lighter on oats, and much more on nuts and fruit. Florenta is the binding ingredient and it's a mix of "Glucose, Sugar, Hydrogenated Soy Oil, Dextrose, Nonfat Dry Milk, Lecithin, Dried Heavy Cream" - probably pretty hard to duplicate. It is a "powder"...so that's what the bakery lady probably meant when Cheryl asked her...but it's not plain powdered sugar. I can't find a source to buy it in small quantities. If someone finds one, would love to know where. Honey/maple syrup will probably not produce the same results but will undoubtedly be better for you!